These 10 facts will show you just how much of trailblazer Pat Nixon was. Pat Nixon is the most underappreciated, and misinterpreted, first lady of the 20th century. Her five years of accomplishments as first lady are overshadowed by her husband's presidency and, of course, the Watergate scandal. In the time I spent researching her at the Nixon Library in Yorba Linda, I came to admire this woman for her kindness, work ethic, strong character, and love for family, children, and country. In honor of Women's History Month, below is a list of 10 of Pat Nixon's "firsts" as first lady (and that's only a few!). If you love American history as much as I do, take some time and discover the true Pat Nixon. You'll find she is a hidden gem in this nation's history. In July 1969 Pat Nixon became the first first lady to step foot in a combat zone, meeting with soldiers just miles away from Saigon. When President Nixon was searching for a candidate to appoint judge on the Supreme Court, she publicly pushed for a woman to be appointed to the position. Nixon did not appoint a female to the Supreme Court, Ronald Reagan became the first president to do so in 1981 when he appoint Sandra Day O'Connor. She sat in on many of the president's cabinet meetings, promoting the importance of the role women play in government. Pat Nixon had wheelchair ramps installed at the White House, making it handicap accessible for visitors. In addition, she established White House tours for the seeing and hearing impaired. In 1972, she became the first Republican first lady to address a Republican National Convention. Eleanor Roosevelt was the first first lady to have done so at the 1940 Democratic National Convention. While on an African tour in 1972, Pat Nixon became the first first lady to deliver an address to a foreign nation's parliament when she addressed the people of Liberia. Though Jacqueline Kennedy famously restored the White House, Pat Nixon was the first and only first lady to receive an honorary membership into the National Society of Interior Designers for her extensive renovation work on the White House. In total, more than 600 items were restored during the renovation. In November 1970 the White House was illuminated at night for the first time due to Pat Nixon's call for those not able to visit the White House during the day to have the opportunity to see it clearly at night. Pat Nixon asked assistant executive chef Hans Raffert to create a traditional A-frame cottage Gingerbread House in 1969, beginning the beloved annual holiday tradition at the White House. Last, but not least, Pat Nixon was the very first first lady to wear pants in public. She even went as far as to model them for a national magazine. 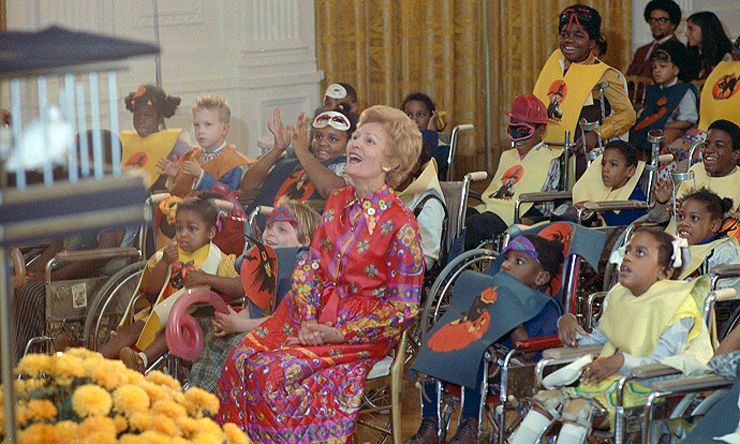 During her tenure as first lady, Pat Nixon opened up White House doors to the handicapped. Here she is pictured at a Halloween Party for local children in 1971. All research and photographs are courtesy of the Richard Nixon Library. A short description about a young man trying to find his way through adversity.